"Hey, see my hiking socks? They're POSSUM!" Before you get all creeped out about wearing possum clothing, you're missing a very important letter O - that's the difference between opossum and possum. 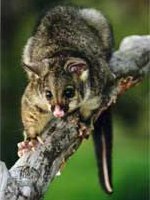 The possum of New Zealand are native to Australia but were introduced and are now overrunning NZ. They are furry little critters that eat tons of vegetation and protected bird eggs, and are considered a nuisance pest. But their hollow hairs make very good, soft, insulating material. By exterminating the possums and combining their hairs with merino wool, the basis for a unique clothing line of warm, light articles is created. I think it's pretty cool to turn the problem of an invasive species into a successful business that helps keep the invasion at bay. And that's exactly what a New Zealand clothing company is doing by making possum clothing. Brian at New Zealand Possum Merino sent me a pair of possum hiking socks to try out. My first impression was "Wow! They're soft and light!" Softer and warmer feeling than heavier socks, I wore them inside for a day and my feet were very happy. They will be great for normal wear during the winter. Right now, it's quite hot here and I figured they'd be too warm for hiking. But, I've been wearing them on my hikes around town and even a few miles of jogging. They weren't hot and they didn't absorb sweat like cotton socks. The extra softness has been pleasant and they've held up well. There's been only a tiny bit of piling and they've been washed a few times now. The combination of merino wool with possum hairs makes a sturdy, comfortable, warm cloth. The socks aren't inexpensive, but a couple extra dollars for such a unique conversation starter might be worth it for the hiking scout looking for a nice pair of socks for fall/winter/spring outings. Driving around New Zealand, the roads are very curvy. There seemed to be a smashed possum at the midway of each curve. The flightless birds are getting creamed by the feral cats, rats and other nasties that man has brought, as well.